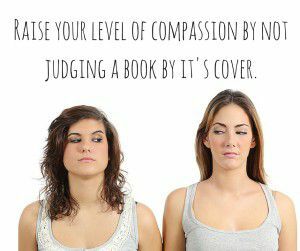 I’m sure you’ve heard this phrase before, “Do not judge a book by its cover”. In one week, I have had three people tell me how healthy and great I look…..on the outside. I could say that I am good at fooling people as to what is really going on inside my physical body. This is one of the challenges people who live with MS (multiple sclerosis) have. More often than not, people do not know someone has MS unless they see some external sign such as limping, walking with a cane, dragging of the leg, lost of balance, or apparent brain fog. Trust me, no one with MS wants to be noticed for that. When I tell people about all the symptoms I have to manage, they are shocked because they can’t visually see any of them. I even had someone say to me, “I don’t know what they told you you have, but you have more energy than most people I know.” I definitely have those moments where I am high energy, talk your ears off or dance my feet off, but I also have many moments where I can barely function. I can’t even put food on the table for my family because I’ve been hit with a bout of fatigue. The MS fatigue is not the typical midday tired feeling that many people get. It’s like being in a boxing fight where you have given everything you have and keep fighting because you want to win. But then comes that one blow to knock you out and you can’t get up from the canvas. The judge has counted down and announced you to be defeated. I am not used to being knocked out. I trained in karate for eight years and earned a black belt. I loved competing and usually came home with a trophy or medal. I still have the attitude of fighting hard, not giving up and powering through pain or tough times, but also, I have had to allow myself to feel defeated and weak. Notice, I said, allow myself to FEEL! Not become or be defeated or weak. All of us feel less than at some point or another, but we resist it. When you can allow yourself to feel the uncomfortable, the negative emotions, and know they will come and go like the waves in the ocean, it’s a lot easier. The perception we hold on those emotions and what we make it mean is what creates the most pain and suffering. When I first found out I had MS, I fought through those many days of feeling like I couldn’t go on but kept going. One day, I had such bad fatigue and I needed to pick up my daughter and take her to gymnastics. I wasn’t sure how I was going to do it, and that day, no one could do it for me. I decided to stop at a gas station and buy a Red Bull. I had not had one of those in 17 years or so. Because I eat so healthy and do not like to put any chemicals in my body, getting a Red Bull was pure desperation on my part. I’ve never been a drug addict, but in that moment, I felt like what I think a heroine addict might feel like. I wanted something, just this once, to take my fatigue away and the emotional pain of feeling so incapable. I felt like I would have taken anything in that moment that would have given me that end result. I was able to take my daughter to where she needed to go, but as soon as I got home, I slept for one hour. Can you imagine sleeping after drinking a ton of caffeine, taurine and B-12 vitamins? That is the difference between MS fatigue and just being tired. I’ve learned to slow down, take naps and be ok with not doing all that I set out to accomplish in one given day. I am one of the lucky ones who can take those naps when necessary, however, not everyone has that luxury. Most people with MS do not do well when exposed to heat. Whether being outside in the hot sun or raising their body temperature through exercise affects any and all symptoms they have. For example, when I am outside in the heat, which is hard to me to avoid since I live in South FL, I start losing my balance and my eyesight is greatly affected. In addition, I sometimes have difficulty breathing and get burning sensations in my feet and legs. I have never ran a marathon, but running a few errands in South Florida can feel that way to me except that I don’t get the exhilarated satisfaction of having accomplished such a feat. I don’t write blogs often, but I write when I feel compelled to share something that might give someone new awareness. The purpose of this blog is to educate those who don’t know a lot about MS and it’s also a great reminder to everyone to take back your projections, especially when you think the grass is greener on the other side! My grass may look green, but it’s often just an illusion. Comparing or thinking others are better off than you are is the biggest trap I know that will rob you of your self confidence and ability to keep you from being all of who you are capable of being. Water your own lawn and see how green you can make it!